For the last two weeks Annelise had been counting down the days until Take Your Child to Work Day for NASA/JSC employees. Every day she'd ask for confirmation that her tally was right at least once or twice, or twenty times. I think Scott learned, for his future reference, not to tell her about exciting events too much in advance. 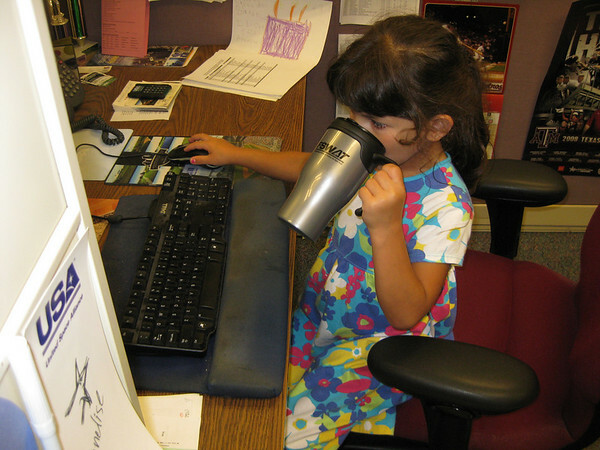 This year children ranging from Kindergarten through High School were invited to spend the day at their parent's job. The morning started early at Space Center Houston with an introduction/welcome session and an IMAX movie. There were lots of space related exhibits, shuttle mock-ups (don't tell, but Annelise crashed the shuttle during landing) and an indoor play area that was quite popular. 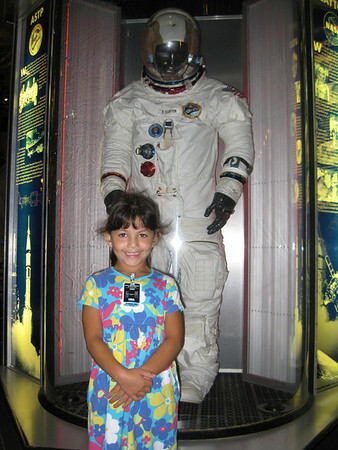 Annelise was excited to see some of the space related memorabilia, like this EVA space suit, but she was MOST excited about something else. 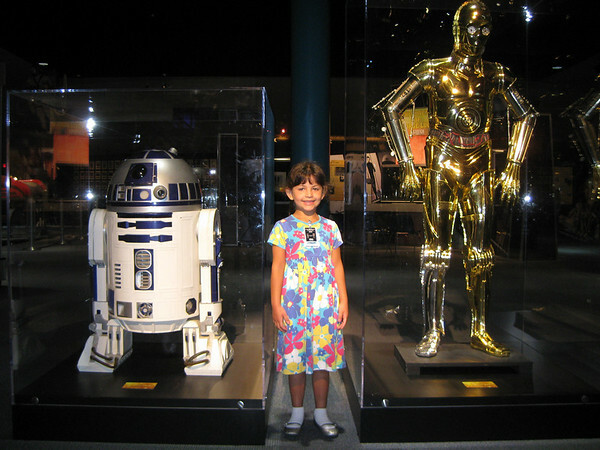 This summer Space Center Houston is featuring exhibits on George Lucas and Star Wars. Of course she was beside herself with joy. See? The rest of the day consisted of normal work stuff (meetings and such) for Scott while A. tagged along, a hot dog lunch in the cafeteria, coloring and playing with two other visiting kids close to her age and playing a NASA computer game installed especially for the day. It's all in a day's work. All this hard work requires an occasional jolt of caffeine. Er...make that water, she is after all only five. She came home with a bag full of NASA stuff (posters, pictures, stickers, etc. ), her own name badge, and some Pez dispensers she pilfered from Scott's desk. She was most excited to bring home a Millennium Falcon toy Scott had hidden at work and a Tie Fighter his coworker gave her. NASA is cool, but nothing can top Star Wars. when my son finds out about this he is going to go bananans & try to run away to your house... does A want a big brother?? Wow! What great experience for her...and what a great place to work! I can see why she was so anxious! hee hee! I love the glimpse at Scott's cubicle!!!! What a terrific day! Ever since I posted this I've been stressing about the use of take vs. bring. Maybe it should have been bring? Grrr...grammar police HELP! Scott works for one of the NASA contractors (United Space Alliance), so part of the day was spent at Space Center Houston and then back at his office. What a cool thing for all the kids to get to do! It looks like Annelise is a natural in that last photo. Does this mean you got to have the whole day to yourself? Do tell. Jill: The timing of it worked out so that I was able to go to the memorial service for my friend Heather's grandfather.